With weather warnings predicting snow and ice, power failures become more common and the immediate casualty is home heating, cooking and hot water. Gas and oil fired central heating systems all depend on electricity for their pumps, and electric fires, kettles, cookers and microwaves all stop working. An alternative form of heating, cooking and hot water is vital, and could even be lifesaving in the event of a prolonged power outage in rural areas. 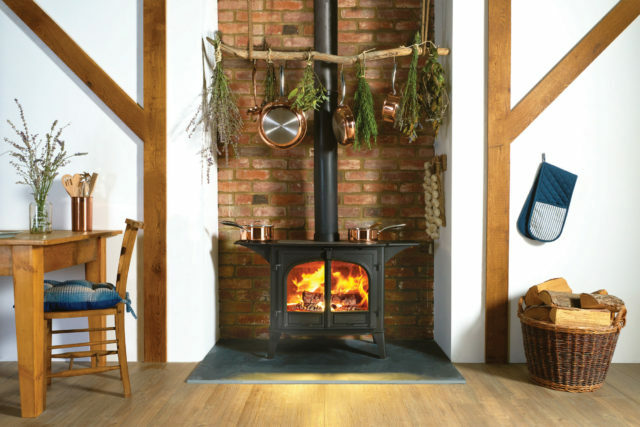 The Stockton Cook Stove is one answer, providing abundant warmth for most living spaces and a large hotplate cooking area – ideal for boiling a kettle of water, cooking a casserole and heating saucepans. Burning either wood or solid fuel, it can also be fitted with steel warming shelves, so that food can be kept warm once cooked. What is more, when the electricity fails and you need hot water for washing, shaving, or heating a bowl of soup, the Stockton becomes invaluable.